We’d love your help. Let us know what’s wrong with this preview of Dead Ends by Sandra Balzo. To ask other readers questions about Dead Ends, please sign up. What should have been a simple trip home for journalist AnnaLise Griggs has turned into a nightmare. It is time for college to start and who shows up in Sutherton, North Carolina to start class, Suzanne Rosewood with her parents in tow. Her mother, Tanja and her father, Benjamin, the district attorney of Urban County, Wisconsin. AnnaLise and Ben have a bit of a past. A past she would love to forget. Now it has followed her home. AnnaLise has errands to run and the Rosewoods all have plans so the What should have been a simple trip home for journalist AnnaLise Griggs has turned into a nightmare. It is time for college to start and who shows up in Sutherton, North Carolina to start class, Suzanne Rosewood with her parents in tow. Her mother, Tanja and her father, Benjamin, the district attorney of Urban County, Wisconsin. AnnaLise and Ben have a bit of a past. A past she would love to forget. Now it has followed her home. AnnaLise has errands to run and the Rosewoods all have plans so the visit is none to sweet but very short. That is until AnnaLise learns that Tanja has had an accident on the treacherous mountain road outside of Sutherton. The tragic accident turns out to be deadly. Then there is another death and AnnaLise just can't shake the feeling that these deaths are related. Her journalist instincts take over causing her to learn just how far people with go to get and keep what they believe is theirs. When you think of Sandra Balzo you think of Small Towns - Big Crimes and that is the story she delivers. The story is full of southern charm. The Woolly Worm Festival is right around the corner. Mama Philomena's restaurant serves up recipes like Corn Flakes Crunchy Baked Chicken, Grape Nuts Pudding and complimentary Chex Mix, the comfort food Mama (Phyllis) grew up on. And like any small town everyone knows everybody's business. Or do they? The mystery is a delight, full of red herrings that keep the reader guessing as the clues all come together in unimaginable ways. Funny by the end everything makes perfect sense. The twists and turns are not all in the story. The roads around Sutherton are crazy. I was gripping the book and holding on for dear life in several places. I would be a driver just like AnnaLise, timid, slow, mindful of the drop offs, but her mother and others that drive those roads daily tear up and now the mountain with ease. Suffering a near death on a curve of the mountain, Daisy and AnnaLise hold on to their lives as their car hangs precariously close to the drop off as their car is hit, or was it. Having heard a gunshot shortly prior the accident, both ladies are incredibly confused. A village friend, Josh appears and reassures both that he has phoned 911. When the emergency crews arrive, they are surprised to see the ladies and running after a loose wheel, looking over the cliff, another car is found. Meanwhile, AnnaLise is shocked to find out that the wife of Rosewood has been killed as her car flew off the other side of the mountain, minutes before her accident...was it an accident or planned? When AnnaLise's mother's front window is shot out the matter falls heavily into the hands of the Police. This book was terrible. Stephen King says that good writing is real life with the boring parts left out. Apparently this book is not good writing. There were so many boring descriptions of her driving down main street, pulling in to a parking space, throwing key her bag, walking up the steps... blah. blah. blah. I didn't get much of a feel for the characters beyond what was on the back of the book jacket and there was an overall lack of tension. Why a 2 star review instead of 1? I read the whole b This book was terrible. Stephen King says that good writing is real life with the boring parts left out. Apparently this book is not good writing. There were so many boring descriptions of her driving down main street, pulling in to a parking space, throwing key her bag, walking up the steps... blah. blah. blah. The main character goes back home to care for her mother. Her former lover and his family arrive in town a short time later. Suddenly people start dying....his wife's tire is shot out and she goes over a mountain, his daughter is shot and all the evidence points to AnnaLise, the main character. Even her long time friend and police chief starts to wonder if she did it. An okay story. I hate it when I start a series and enter it mid-way; whether it is the second book in the series or the fourth book in the series. When I won Dead Ends from a goodreads giveaway and learned that it was the second book in the series, I felt a bit iffy about it. Then when I also first started reading Dead Ends, I automatically knew that the book was not for me. To start with, the first few chapters were dull, long, and boring since I didn't know any of the characters and what was happening. I didn't know any relationships or how the relationships between the characters were unless otherwise mentioned. The vocabulary and words used was also a little too eh for my taste. The writing in Dead Ends was also weird. When I read books, dialogues often begin and end with "...". That was not the case in Dead Ends. Dialogues begin and end with '...'; and excuse me for being petty, but I couldn't stand it since I wasn't used to reading books like that. This review has been hidden because it contains spoilers. To view it, click here. I received this book for free through Goodreads First Reads Giveaway. When I first started this book, I felt like the characters were being thrown out at me all at once. Anyone that was associated with the main character were all mentioned in the first few chapters. It wouldn't have been so bad, but each character had more than one name that they went by and some were duplicates and it made it a little hard to follow who was talking and who was who. The book really took off in the middle when the I received this book for free through Goodreads First Reads Giveaway. 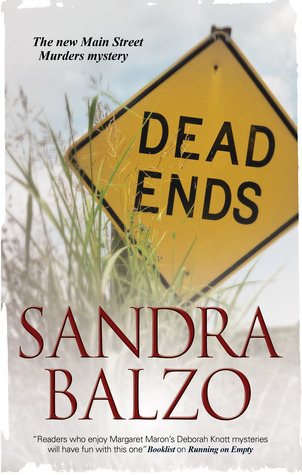 Dead Ends is the second installment in Sandra Balzo's Main Street Murders series. While I am a big fan of her Maggy Thorsen series, this one just isn't quite as good though it is hard to pinpoint why. Maybe it's more of relating to the other character just a bit more. AnnaLise is shocked to see her former lover show up in her town with his wife and daughter. Not surprisingly, the wife is killed in a tragic car accident. Once it becomes obvious that it was murder, AnnaLise starts trying to figure Dead Ends is the second installment in Sandra Balzo's Main Street Murders series. While I am a big fan of her Maggy Thorsen series, this one just isn't quite as good though it is hard to pinpoint why. Maybe it's more of relating to the other character just a bit more. AnnaLise is shocked to see her former lover show up in her town with his wife and daughter. Not surprisingly, the wife is killed in a tragic car accident. Once it becomes obvious that it was murder, AnnaLise starts trying to figure who did it. She is also dealing with her mother whose memory is slowly starting to fade. This seemed to pick up right after the first book as AnnaLise is still on her one-month leave of absence and still insists that she'll be returning to Wisconsin. Journalist AnnaLise is still waiting to learn of mother Daisy has early-onset Alzheimer's when her former lover, district attorney back in Wisconsin, shows up--with his wife and daughter. When a death follows, AnnaLise becomes a suspect, although the police chief is her best friend from high school. She's sure that she knows who the real killer is, but she has no proof. As more secrets are exposed, she and Daisy end up in danger. Good characters and plot. Fun small town to which the main character returns for family reasons after living in the big city. Ends up in the middle of the deaths of family members of her former lover who she never expected to see in her hometown. Various suspects including the main character for a time although it gets resolved by the end. I was lucky enough to win this book from a Goodreads giveaway. I like a mystery and this was a good one. A quick read featuring characters that were easy to like. It had a down home feel based on it's location that added to the book. Another light summer read. This is one where you feel like you know the people and the place. What I call "quaint, quirky little town I'd like to live in" stories. I'll read more of these. When I started this book, I didn't like it that much. But by the end was quite wrapped up with the characters. Now I just may have to read the first one!